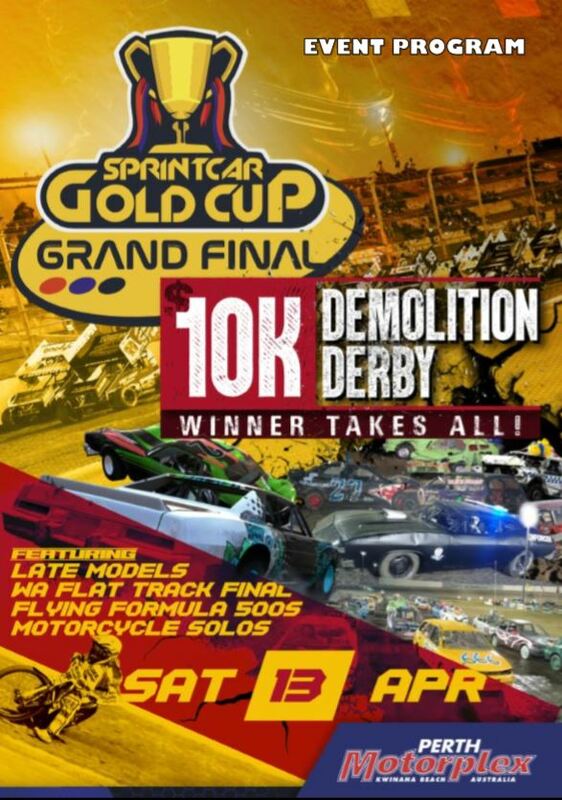 Sending the summer of speed off with a HUGE BANG the Perth Motorplex presents Gold Cup Grand Final featuring $10,000 Winner Take All Carbusters Demolition Derby. Super Speedway kicks off at 6pm with The 900 horse power Sensational Sprintcars and awesome Late Models explodes into action with some action packed sideways mudslinging on the highbanked home of WA Speedway. The Speedway Motorcycle Solos and WA Flat Track Final plus Flying Formula 500s, and the Pool Shop Group Speedcars hitting the dirt oval. Click the image below to view our free online event program. Entries for event close Apr 3. Visit our competitors page for more details.